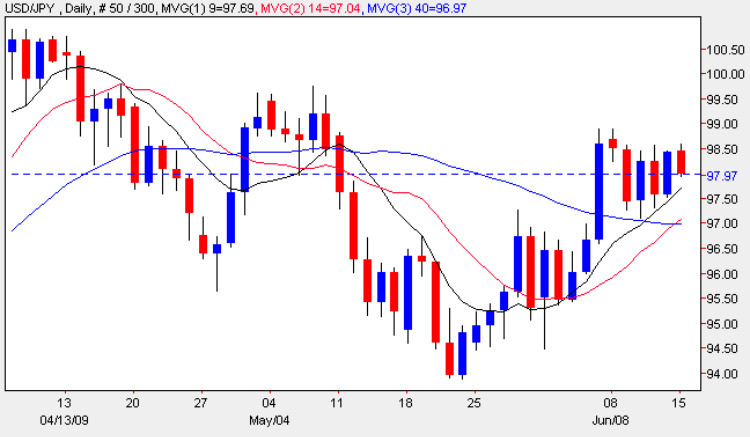 Friday’s up candle in the yen to dollar currency pair came as no great surprise reversing that of Thursday, and continuing the metronomic and increasingly tedious sideways consolidation of the last few months, which at present shows little sign of ending. Indeed this morning’s price action has reversed Friday’s gains creating a very neat series of candles almost post modernist in their interpretation. With no clear direction in this pair my advice remains the same which is to stay out until we see a break above 102 to the upside or 94 to the downside and a quick look on the weekly chart would seem to favour a initial move higher although in the longer term we may well have a period of lower highs and lower lows. With no items of fundamental news on the economic calendar for Japan the markets have focused on the US where TIC data came in massively lower than expected at 11.2bn against a forecast of 58.1bn. The Empire State data also came in worse than expected at -9.4 against a forecast of -4.7 and the rest of the day is taken up with a variety of speeches from several FOMC members and Treasury Secretary Geithner.